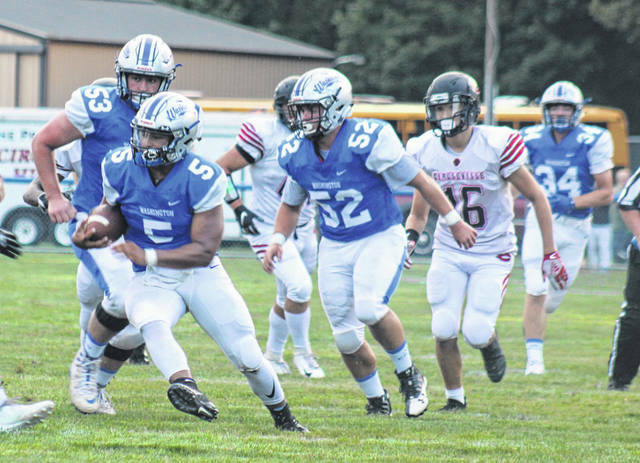 The Washington Blue Lions celebrated Senior Night for the 2018 season with a 68-6 thrashing of the Circleville Tigers Friday night. The Blue Lions scored virtually at will before a very large crowd for the home opener at Gardner Park. Washington held an overwhelming 53-6 lead at the half. Gio Thomas got the scoring started with an 18-yard run at the 10:53 mark. Dillon Steward’s kick gave Washington a 7-0 lead. The Tigers answered with a 33-yard touchdown run by Cade Burton. The extra-point kick was no good, leaving the Blue Lions with a 7-6 lead. That would be the extent of the scoring for the Tigers on this night. Washington quickly responded with an 84-yard kickoff return by Steward. Washington’s point-after kick was no good with 8:40 to play in the first quarter. Circleville’s next possession resulted in a fumble, recovered by Washington freshman Tyler Tackage. Thomas’ run set up a 13-yard touchdown run by Steward. Steward’s kick gave the Blue Lions a 20-6 lead with 5:25 remaining in the initial period. After a Circleville punt, Thomas passed to Steward, who out-leapt the Tigers’ defender for the catch and took it in for a 55-yard touchdown. The kick was no good, giving Washington a 26-6 lead with 3:19 to play in the first quarter. The score remained 26-6 after the first quarter of action. Early in the second quarter, Washington was at it again. Thomas connected with Steward for a 48-yard touchdown play. Nick Bishop’s kick gave the Blue Lions a 33-6 lead. Just moments later, Jalen Pettiford caused a Circleville fumble that was recovered by Brandon Cubbage. This turnover resulted in a 16-yard touchdown run by Thomas. Bishop’s kick put the tally at 40-6 with 9:33 to play in the first half. With 7:16 to play in the half, Steward scored on a two-yard run. Bishop’s kick pushed the score to 47-6. With 1:57 to play in the half, Omar Porter scored on a two-yard run. The extra-point attempt was no good, giving the Blue Lions a whopping 53-6 lead at the half. Washington added two touchdowns in the second half, which was played with a running clock. The first was a 33-yard run by Jameson McCane with Bishop adding the extra point with 9:45 to play in the third quarter. Tyris Virts ran in a touchdown from eight yards with Cubbage running for the two-point conversion. Taking a look at the statistics, Washington had 464 total yards of offense on 40 plays for an 11.6 yards per play average. Circleville had 205 yards on 55 offensive plays, an average of 3.7 yards per play. The Blue Lions were well-balanced, with 237 passing yards and 227 yards rushing. The Tigers had 99 yards passing and 106 yards rushing. Thomas completed 11 of 12 passes for 235 yards and three touchdowns with no interceptions. Virts had one completion for two yards. McCane led the Blue Lions with 99 yards rushing and one touchdown on seven carries. Jayden Fettig led the Blue Lions with 6.5 total tackles. Brandon Cubbage had 5 tackles and Tyler Tackage, Kolton Jackson and Richard Burns Jr. had 4 tackles. Circleville had three turnovers to one for Washington. Washington (2-0) travels to London (2-0) next week. Circleville (0-2) has its home-opener against Westfall next week.